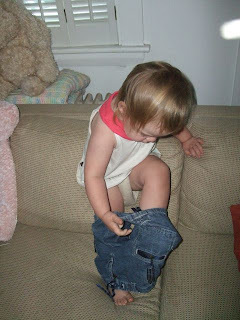 Since turning two, Margot has become very opinionated about what she can and can't do. This has lead to some pretty hysterical situations. 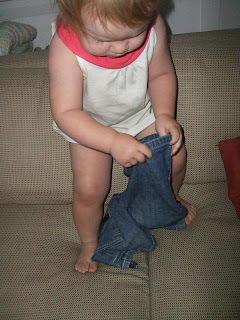 Case in point, Margot was determined to put these pants on HERSELF! Who are we to tell her that they are upside down and won't stay on that way? In addition to trying the impossible, Margot also puts hysterical limits on what she can and can't do. She has instituted the rule that "Margot cannot walk up the stairs." Note, this is not because any parental figures have told her that she can't, but because she wants to be carried up. She actually goes up the stairs many times a day on her own to get things that I won't get for her. My favorite random rule came out yesterday when we were getting ready to get into the car. After insisting that she had to wear her new rain boots in the sunny 70 degree weather, Margot then claimed that she had to be carried to the car "Because Margot has her boots on. "* I looked at her and had no idea where to start arguing about how wrong this was. Of course, I gave up and just carried her to the car, shaking my head the whole time. * Yes, Margot refers to herself in the third person.